HE Mr Abdullah Gül, President of the Republic of Turkey, today delivered our inaugural Annual Address, entitled ‘Historic transition in the Middle East and its impact on global politics’ at the Royal Society in London. With fragile democratic transitions under way across the Middle East and North Africa, Turkey’s political and economic development is seen as inspirational by people in countries of the Middle East. 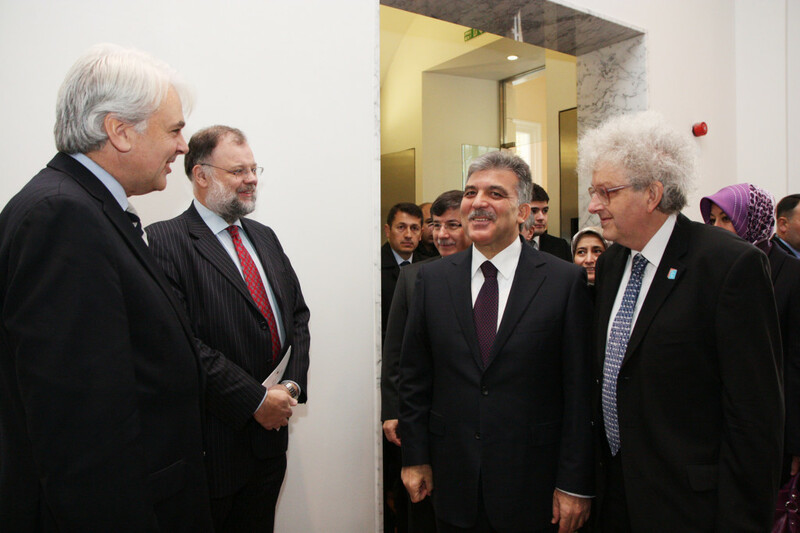 Above: President Gül is greeted by our Chief Executive, Richard Burge and Iain Ferguson, Chair of the Wilton Park Board. Attending the annual address were ambassadors from a range of countries, UK parliamentarians, policy makers across government departments, policy analysts and opinion leaders, academics and non-governmental organisations. The Address was on the record, and covered by broadcast and print media. The Wilton Park Address is an official part of President Gül’s three-day state visit to the UK, the first visit by a Turkish President for 23 years, which also included meetings with the Royal family, Prime Minister David Cameron, influential London based CEOs, Lord Mayor of London, Boris Johnson, and an address at the Houses of Parliament. We have a longstanding relationship with Turkey and her people and has held three conferences in Istanbul since 2007 in cooperation with the Turkish Ministry of Foreign Affairs. Foreign Minister Ahmet Davatoğlu discussed Turkey’s foreign policy vision in March 2011, at our most recent event, addressing Turkey’s policies for engagement with the contemporary world. Download a copy of the report as a PDF. Turkish policy-makers and other experts contribute regularly to our conferences across a broad range of issues including Bosnia and Herzegovina, Afghanistan, NATO, the European Union, the South Caucasus, the Middle East, science diplomacy, managing natural disasters, missile defence and conflict prevention. What future for Bosnia and Herzegovina in Europe and the Euro-Atlantic community?